The U.S. has a tentative deal with Mexico but our neighbors to the north seem unwilling to compromise, a member of Congress says. WASHINGTON — U.S. and Canadian negotiators – facing a deadline at the end of the month – will extend until at least Thursday their negotiations to keep Canada in a North American trade bloc. 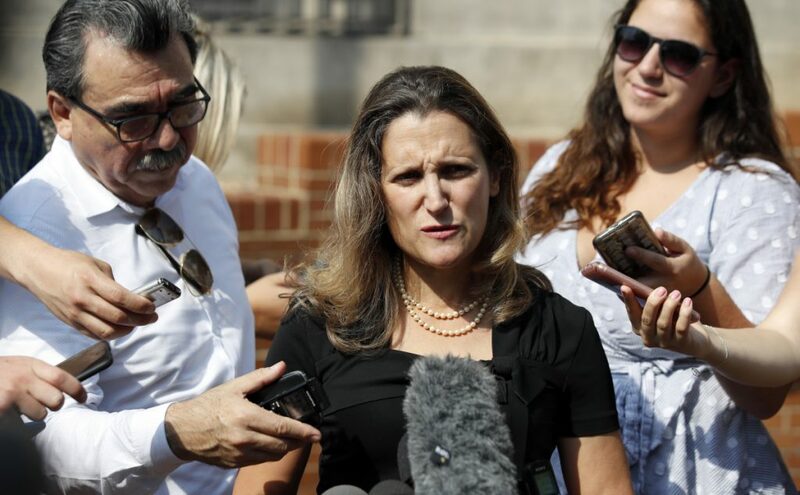 After her second meeting of the day with U.S. Trade Rep. Robert Lighthizer, Canada’s Minister of Foreign Affairs Chrystia Freeland told reporters they plan to keep talking Thursday. President Trump began negotiations last year to revamp the North American Free Trade Agreement with Canada and Mexico. The U.S. and Mexico reached a preliminary deal last month designed in part to shift more auto production to the United States. But Canada wasn’t part of that agreement. Freeland is trying to get America’s No. 2 trading partner back into the trade bloc. The countries are under pressure to reach a deal by the end of the month when Lighthizer must make public a copy of the full text of the agreement with Mexico. Until then, he has wriggle room to reinstate Canada. Among other things, the negotiators are battling over Canada’s high dairy tariffs and policies meant to keep the country’s culture from being overwhelmed by U.S. movies and television. Canada also wants to keep a dispute-resolution process that was part of NAFTA; the Trump administration wants U.S. courts to have jurisdiction. Trump considers NAFTA, which took effect in 1994, a job-killing disaster for the United States. The agreement tore down most trade barriers between the U.S., Canada and Mexico, leading to a surge in trade, but it encouraged U.S. automakers and other manufacturers to move south of the border to take advantage of low-wage Mexican labor. Trump has said he wants to go ahead with a revamped NAFTA – with or without Canada. It is unclear, however, whether Trump has authority from Congress to pursue a revamped NAFTA with only Mexico, and some lawmakers say they won’t go along with a deal that leaves Canada out. But others are also turning up the heat on Canada. “Members are concerned that Canada does not seem to be ready or willing to make the concessions that are necessary for a fair and high-standard agreement,” House Majority Whip Steve Scalise, R-La., said this week. In Ottawa, Canadian Prime Minister Justin Trudeau said Canadian negotiators would continue to defend the country’s agricultural policies.